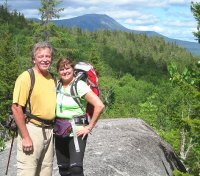 Guests love the scenic beauty of this day hike, and we are very happy to give you a full briefing and directions to help you prepare for the day. 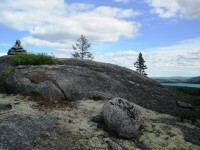 As you can see in these photos, there are many beautiful places to stop for a rest or lunch. 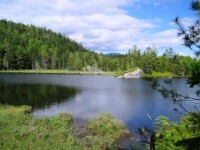 The Horserace Pond Trail (4 miles round trip) and Blue Trail (5 miles round trip) provide access to some of Maine's most pristine ponds. Both trails cross a wooden bridge over a stream and pass through the forest for about a half-mile before splitting at the intersection of the Horserace Pond Trail and the Blue Trail. 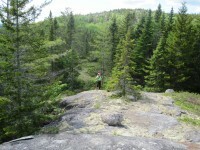 The hike to Horserace Pond (2 miles) is "easy" in our mind, traveling gradually uphill. The new scenic trail (Blue) leaves the pond and gains about 600 feet in elevation as it heads south to the Rainbow Outlook. 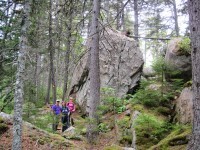 That part of the trail was very nice and it is good all the way to the Katahdin Outlook. Once you start downhill, the trail becomes rather "tight" and difficult in some spots. It is best to hike the loop counter-clockwise because clockwise is much harder. The Horserace trail markers are yellow, the "loop trail" is orange and the Rainbow trail is blue. 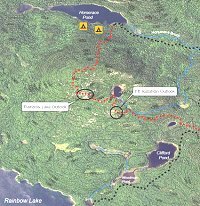 The "Blue Trail" goes to Rainbow Lake. It leaves the Horserace Trail (yellow trail) about 1/2 mile from the trailhead. 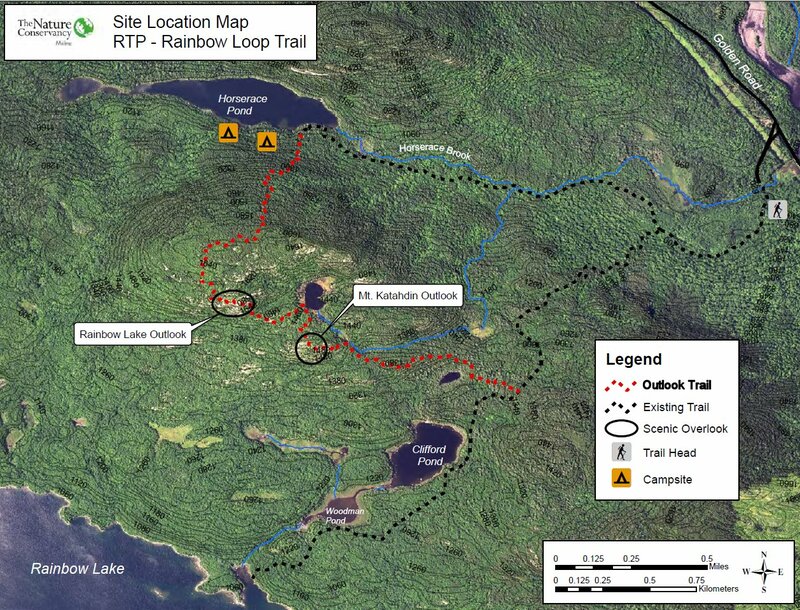 The "Existing Trails" (Black) are the Horserace Trail (yellow markers) and the Rainbow Trail (blue markers). The "Red Trail" (orange markers) is called the Outlook Trail. It creates a "Loop" and runs from Horserace Pond to two different outlooks and then connects to the Rainbow Trail very close to Clifford Pond. 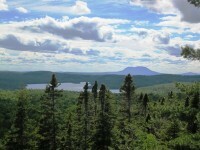 The Nature Conservancy's Debsconeag Lakes Wilderness Area (DLWA) is a vital link in nearly 500,000 acres of contiguous conservation land, located just south of Baxter State Park. Debsconeag means "carrying place," named by native people for the portage sites where they carried their birch bark canoes around rapids and waterfalls. 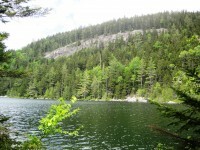 The DLWA contains the highest concentration of pristine, remote ponds in New England, as well as thousands of acres of mature forests. Except for some areas around pre-existing camp lots the DLWA is managed as an ecological reserve. 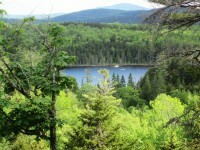 Ecological reserves are areas set aside for conservation and study of Maine's ecosystems. Ideally, reserves are large enough to withstand storms, diseases and other natural disturbances and to provide secure habitat for wide-ranging species like moose, fisher, bobcat and pine marten. Ecological reserves are important to scientists studying how nature responds to challenges such as climate change, forest pests and diseases, and airborne pollution. 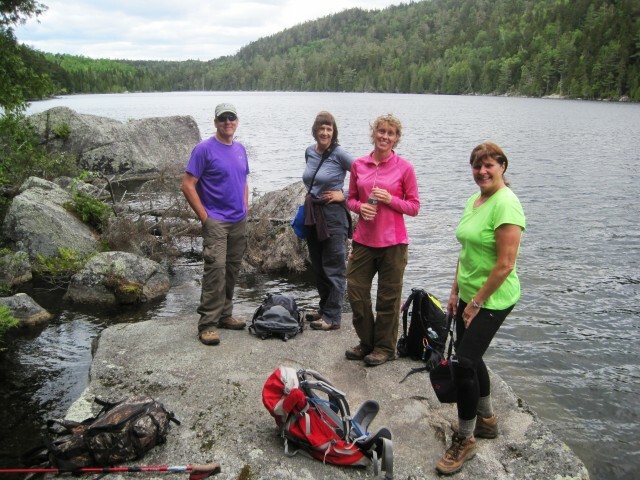 The Ice Cave Trail is on property owned by the Nature Conservancy known as the Debsconeag Lakes Wilderness Area (DLWA), 46,000 acre Wilderness Reserve that is open to the public for a variety of recreational uses. The Ice Cave is a talus type, which means it's a pile of heavy boulders that were plowed together by glaciers during the Ice Age. They didn't fit right so they formed a cave. 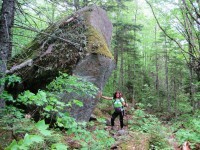 Large talus caves like this one are not very common.